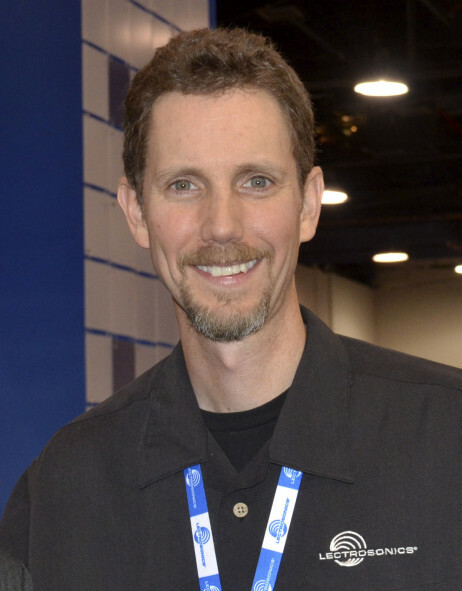 In this episode of Sound Design Live I interview Karl Winkler from Lectrosonics. We discuss the basics of frequency coordination, wireless microphone myths, and how the Super Bowl manages 1,000 channels of wireless devices. Karl also explains what a backup frequency is, whether bluetooth devices, microwaves and cell phones will cause interference, and how to prepare for rogue wireless devices. Music in this episode by The Giovanni Quartet, Brodsky Quartet, The Bartok Quartet, and Brentano String Quartet. Have a good attitude. If your job is to roll tires from the back of the store to the front, you should be so good that people will pay to see you do it. Don’t be afraid of the work or think of it as being beneath you. The basics always matter. Every art and science requires you to know the fundamentals. Really listen. 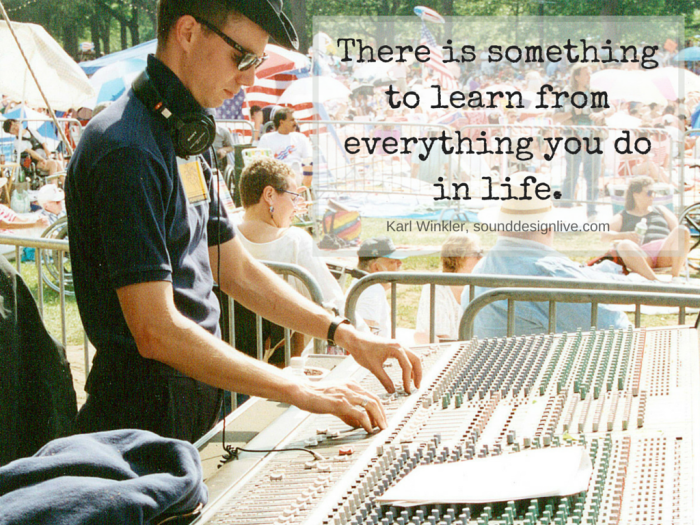 Learn to use use your ears as a troubleshooting tool. See Trouble-Shooting Audio Systems tutorial. A directional antenna is always better. I can get more range with boosted antennas. Cavity Filter = Pass band filter. Blocks out bands of frequencies to focus only on the ones you want. Intermodulation distortion = Occurs when two or more signals mix within an active device and create phantom frequencies. Backup/spare frequencies = Pre-coordinated channels that you don’t need at the moment, but are already calculated to fit into your system design, preventing guess work. Not separating your IEMs, comms, and mics into different bands. Not calculating signal loss for long antenna cable. Looking forward to it. Where do I sign up? This is by far, the best interview that I’ve listened to on your site! I’ve so since been a fan of classical music and if you have roots in classical (in my opinion), you’re at a different level. Classical and Jazz (of course)! Thanks Angie, glad you enjoyed it. It really helps make the interview unique when I can get music that is connected to the interviewee somehow. I just listened to your interview with Karl Winkler on wireless mics. This was a very good interview. Lots of good info. One huge concern that was not discussed has to do with the frequency spectrum changes at the FCC. Wireless mics have traditionally used “white spaces,” the vacant spaces between UHF television stations. The old UHF spectrum extended up to 800 Mhz and many wireless systems operated in the 700 Mhz band between 700 and 800 mhz. In 2010, as part of the transition to digital TV, the FCC forced TV stations out of the 700 Mhz and auctioned this spectrum to cellphone carriers (AT&T and Verizon use it for 4G LTE data). This move also made operating a wireless mic system in this spectrum illegal, forcing wireless users to swap out their 700 Mhz gear for systems under 700. Now, I have heard that the FCC may be preparing to do the same thing in the 600 Mhz band. There is a huge demand for cell data. I get that. But, since wireless systems are unlicensed, we have to find places to live and we are constantly getting evicted, so to speak. Several, myself included, have contacted our congressmen to plead our case. I’ve heard that there may be a plan for operators with more than 50 channels of wireless to be able to license their systems but on a show by show basis but that won’t help people like me. Here’s my real world situation and I know I’m not alone. I volunteer for a local community theater. 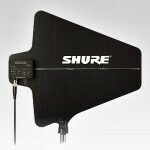 We have 22 channels of Shure SLX wireless. We are non-profit and don’t have deep pockets. In 2010, we took advantage of Shure’s trade-in offer to swap our 700 gear for lower frequencies. Thanks to Shure for trying to help ease the financial blow but it was still a big chunk of money and, back then, we only had 10 channels. Since then, we’ve grown to 22 and about half are in the 600 Mhz band. What makes the issue even worse has to do with channel spacing (Karl talked extensively about this). Based on the analog technology used in the SLX series, Shure has calculated that the maximum number of SLX channels in a system is somewhere around 25. If you take away all the 600 Mhz channels, how many can be packed into the remaining spectrum? In order to keep 22 channels, will we have to upgrade to digital technology for all of them? How much will that cost? Will there ever be any protection for little guys like my theater? Or, is shuffling frequencies going to be a fact of life? In my business, I also work with churches who have less channels than the theater but often have 4 to 8. Many of them get caught up in this as well. I could go on but I’m sure you get the picture. It’s a big concern for smaller operators. I’d be interested to know what Karl thinks and what the latest news is on the topic. Rick brings up some very good questions and some good points. Yes, the FCC is looking to take much, if not all of the 600 MHz band, based on auctions that will likely take place sometime in 2016. Fortunately, the auctions have been delayed twice already, and it’s possible they will be delayed further because of the pushback from various stakeholders such as the NFL, the NAB, the Broadway League, Sports Video Group, and major broadcasters like ESPN & Disney. That said, the loss of the 600 MHz band is inevitable – we just don’t know exactly how much spectrum and when. Following the auctions, there will be a 39 month build-out process where the new owners build their infrastructure (towers, etc.) during which we will still be able to operate until they come online sometime during that period. TV broadcasters who are in that spectrum will also need to vacate, as they did in the 700 MHz band, during that 39 month (3.25 year) period. So this will not happen overnight. Nevertheless, it is coming. Whether analog or digital, wireless mic systems will suffer, particularly the lower-quality ones. The better the system (better filtering, better selectivity, better control over internal intermod suppression, the wider the tuning range, etc.) the more easily the system will be able to adapt to the new, more crowded, and smaller available spectrum. Just because a system is digital does not mean it is free from interference or does not use any spectrum. As before, manufacturers and users will most likely be responsible for making it work. Several manufacturers did rebate and trade in programs. Lectrosonics offered a “re-blocking” service at about 1/3 the cost of new. This will happen again. There is an effort, led by Sennheiser, to pressure the FCC to mandate that spectrum auction winners compensate displaced users (as was done in the UK & Japan, for instance) but this does not look likely to happen. You have done the correct thing by pressuring your representatives in government about this issue. As I see it, the overarching view is that content creation (us) needs to be balanced with content distribution (them). All the spectrum cannot be taken by content distribution, leaving none for content creation. Related to this, the FCC is exploring alternative areas in the spectrum where wireless mic systems can be located. Our view is that until these new areas of the spectrum are defined, the spectrum we have should not be taken away. Thanks for these insights Karl. It looks like smart frequency coordination will only become more and more important.